Read aloud John S. Tatchin's 1852 Letter. Have students think about the letter and discuss with a partner before whole group discussion. Now that the students have been briefly introduced to the Gold Rush, create a KWL chart as a whole class. K--What do the students already know? What information or myths are they bringing to the lesson? W-- What questions so the students have about the subject, or what they would like to know about the Gold Rush. L--What the students have learned or answered, according to their questions. This chart will be used daily as we learn more about the Gold Rush. After creating the chart, teacher will briefly introduce the following websites. These sites have already been navigated by the teacher and lead to the information outlined in the lesson. The Gold Rush web site contains information about the Gold Rush that students may have not seen before. Navigating the web site will help students build a large bank of knowledge for the unit. The goal of this project is for students to understand the excitement and hardships of the Gold Rush. Students will investigate and decide how daily lives were effected. Students have just read the letter from John Tatchin to his mother, and have been given the opportunity to navigate the introduction Gold Rush web site. What was life like for families during the Gold Rush? Those who went and those who did not. Were all miners successful in "striking it rich?" How did the migrants get to California? What drove them to California? Money? Family? Opportunity? Health? There might be a list of sub-questions that will be asked as well. Here are some questions that students may ask. What was it like for a child during the Gold Rush? How did they mine gold? For the people who never found gold, what did they do? What did the miners do after they found gold? What routes did they take? Who went? Race? Ethnicities? Gender? Students will use the Gold Rush web site and other web sites that they were introduced to, to find basic information. They will also use technology and any other resources to find sources such as: letters, diary entries, pictures, government records, maps, and newspaper articles. Students should understand most of the terminology used in the sources, but because some of them were created in the late 1800s, there may be a few difficult words. Students will be instructed to use their resources to investigate the meanings of words or phrases that they do not understand. Students will be held accountable for a large amount of information. Through the navigation they will have decide what information is useful to them and what can be pushed to the side. As a class, we will begin by filling in the KWL chart each day. This will get the students minds focused on the Gold Rush and ready to look for the data that they are still pondering about. Students will be using a concept map to organize their thoughts. 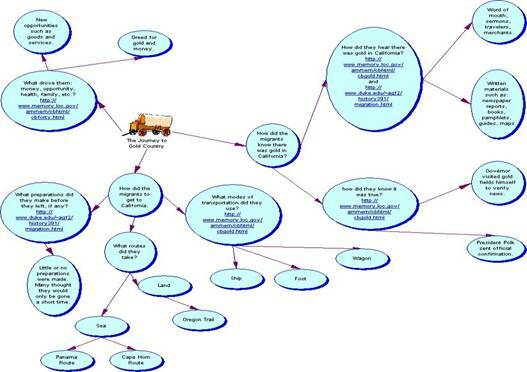 Students will use the concept map daily to keep track of new leads and new thoughts. With this concept map, they will create a daily journal. The journal must be factual and consistent. Each student will be responsible for their own concept map. They are doing the research from the point of view of a specific person (child, woman, father, etc.). All the research will be added to the map. Based upon this map the students will create a daily journal. This would mean that the students would have to have a thorough meaning of the information they are gathering. After the journals are complete, we will use the data to make presentations. 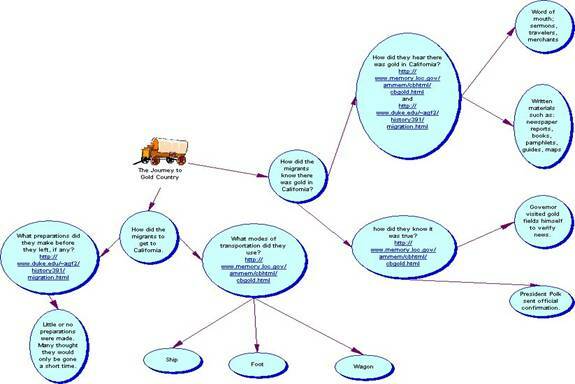 The data is manipulated form concept map to journal to presentation. The presentation groups can be decided by the students, but every student must participate and a section of their journal must be included in the presentation. These are sites that have been thoroughly navigated by the teacher, and follow the format of the lesson. In the hook, a letter was read with the students to create a background of the Gold Rush and to create a link between people from the past and themselves. We also navigated the web sites briefly to give the students an overall understanding and to build upon background knowledge. Students will be examining all of these resources to create their concept maps and journals. The concept maps will be used/updated daily to record new information. Students will be able to analyze the data that they add to their concept map by making personal journals. 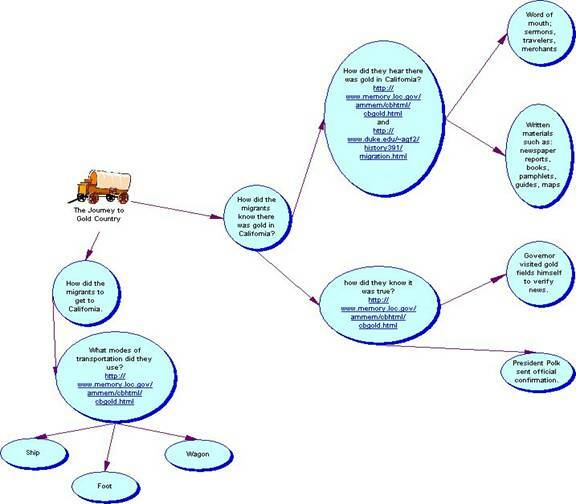 Example analysis to questions is provided below, including concept maps and journal entires. 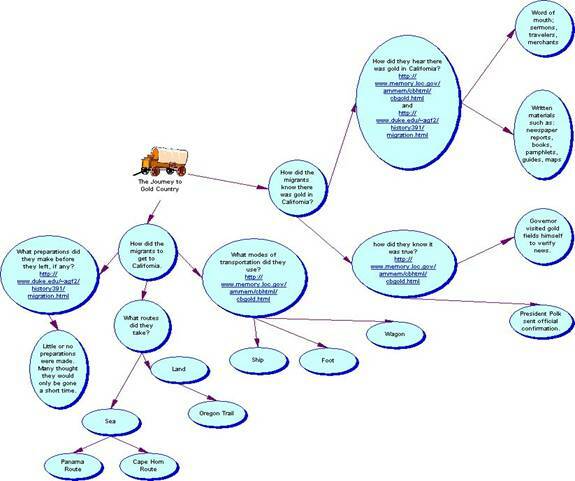 You will be able to click on the final concept map to see the full version with working links. Just when the Mormons appeared seeking employment, Sutter's partner James Marshall found a site for the proposed sawmill, a place called Coloma about 45 miles from Sutter's Fort on the south fork of the American River. Many of the Mormons Sutter hired that summer were assigned to follow Marshall to Coloma, where they finished the sawmill in January. Next they set to work deepening the stream so that the millrace would have adequate power. On January 24, 1848, Marshall went down to the river to inspect progress, and, as he later told the story: "My eye was caught by something shining in the bottom of the ditch. . . . I reached my hand down and picked it up; it made my heart thump, for I was certain it was gold. . . Then I saw another." As word of the gold discovery spread, Sutter's and Marshall's workmen left their jobs to "dig" for gold along the American River and its tributaries, and Sutter's fort and fields were soon deserted. Still, large numbers of prospectors did not arrive until May, when word of the strike--and a sample of gold dust--were shown in San Francisco. Almost overnight, the port turned into a near ghost town as merchants, sailors, soldiers, and laborers rushed inland to the gold fields. It was not long before gold-seekers from all over the state, Hispanic Californians, Native Americans, Europeans and U.S. citizens joined them. 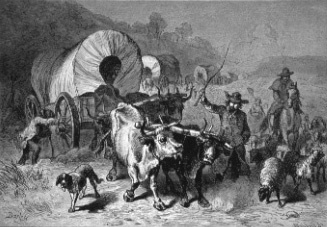 As word spread outside California in the following months, new national and ethnic groups contributed their share to the fascinating mix of the gold fields: Mormons from Utah, farmers and trappers from nearby Oregon, experienced miners from Mexico and Chile, white sailors and merchants and native workers from Hawaii, and Chinese from the province of Kwangtung near Canton. It was no accident that few of the immigrant "forty-eighters" came from the United States. Without telegraph lines or a railroad, news of the gold strike at Coloma had to travel to the Atlantic Coast by the ships that sailed south along the Pacific Coast, then "around the Horn" of South America or across the Isthmus of Panama to await another ship in the Caribbean, a journey that could consume six or seven months. On the other hand, the 7,000-mile journey by sea to China took only three months. Not only did news of the gold strike take longer to reach the eastern United States, but in 1848 it came in tentative, unconfirmed stories that tempted few to chance the long, difficult journey to California. Several factors contributed to the rapid spread of the gold fever. The United States had just won the expansionist war against Mexico, and California´s addition to the United States, following the peace treaty of Guadalupe Hidalgo in February 1848, certainly invited immigration. The Mexican government had lost its authority over the region, and the American government had yet to establish firm control, so the land was largely open and unclaimed by non-Indians with the exception of a few large land grants like John Sutter´s. Weakened by two generations of mission experience and the traumatizing destruction of the mission system after 1833, the Native Americans could offer little resistance to immigrants making land claims. Another factor involved the Europeans who came to the United States after the failure of the revolutionary movements in 1848. Receiving news of the California gold, many did not bother to stay on the East Coast and immediately headed West to seek their fortunes. Most important for triggering the migration were the extremely exaggerated press reports, creating the illusion that every gold digger would become a millionaire, unless he was too lazy to bend down and pick up the gold. According to these newspaper reports gold was literally lying on the ground and stories like the one of a woman who swept gold dust worth 500 dollars from a saloon´s floor within a day spurred people´s imagination and provided them with false expectations. Soon, California gold became the subject of books, pamphlets, maps, guides, sermons, and entrepreneurial promotions that often spread of wrong information about the necessary preparations, mining techniques and tools. Editors in the South also debated the question of the future status of slave labor in California, wondering whether slavery could prove suitable for mining. Although the answer remained unclear, these editors, eager to push for the expansion of slavery, urged Southerners to take their slaves with them to the mines. Thanks to a young Army officer named William Tecumseh Sherman, that situation would soon change. At the end of June 1848, Sherman persuaded his commander, California's military governor Colonel Richard Barnes Mason, to visit the gold fields himself to verify the tales of wealth along the American River. Governor Mason's report of that trip prompted President Polk to make an official announcement of the gold strike in his State of the Union message to Congress on December 5, 1848. This official confirmation of the news triggered a mass exodus to California. The "Forty Niners" were on their way. Although traveling overland on the California Trail took only about 2 months, thus offering Argonauts a time advantage of several months compared to the sea passages, most US citizens went to California by sea since traveling by land on the California Trail brought the risk of scurvy and Cholera. The sea passage led them either around Cape Horn, or via Chagres at the Isthmus of Panama, continued by an overland passage to Panama City and another ship passage to San Francisco. While the route around Cape Horn took about 8 months, Argonauts who chose to go via Chagres-Panama travelled for only 5 months. In 1850 approximately 11,700 prospective gold diggers used the Cape Horn route, and another 13,800 migrated via Chagres and Panama. 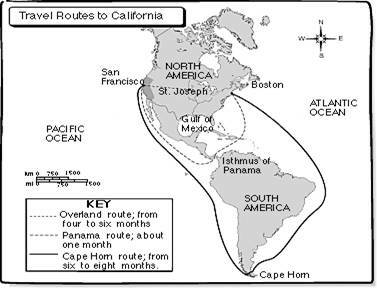 Despite the time advantage, the latter route had its flaws, since overland travel across the Isthmus of Panama led them through fever-ridden swamp areas, and even when the migrants arrived safely on Panama´s Pacific Coast it was often difficult for them to obtain passage to California. Thus, the stop-over in Panama could extend from a few days to several months, depending on the weather and the availability of ships. For many Argonauts, this was their first encounter with the tropics and a Spanish and Catholic culture. While admiring the landscape, most of the impatient visitors despised Panamian culture, often calling the native population lazy and "heathen" -- a term which Protestant travelers often used as synonymous with "Catholic." Given the supposed abundance of gold, there was no reason for the Argonauts to prepare for an extended stay, so their rapid migration did not conform to classic patterns. Traditionally in America, migrants had moved by kin-group to recreate an existing way of life, or had moved as members of a utopian settlement to establish an new and better way of life. Instead, migrants to California often planned to remain for a year or less, hoping to becoming rich or at least making enough money to provide them with security and the resources to return home. Thus, most men believed they could easily leave their families behind for a few months and return in winter with their pockets full of gold. While the poor had an obvious motivation to head for California if they could afford the trip, many middle class men also saw a possible chance to get rid of the debts that afflicted them in mid-century North America. For younger Argonauts, the journey to California also became a kind of declaration of independence from parents and siblings. The departing gold-seekers faced an immediate problem. California was a long way from home. There was no railroad to whisk them west; no river to float them to California. Instead, the journey would be a painful test of endurance. There were two miserable choices. The sea route around the tip of South America often took more than six months. But the alternative wasn't much better--a 2,000 mile walk across the barren American outback. in a ship's hold was almost impossible to drink. And then there was the boredom--months and months at sea with nothing to do, except dream about gold. The wait was intolerable. To satisfy the growing thirst for speed, a quicker route was soon employed across Panama. It seemed like a logical shortcut. But traversing the rain forests of Central America in the 1840s was an adventure in itself. Malaria and cholera were common. Those who survived to see the Pacific faced another dilemma--they were stranded. Ships to ferry them up the coast to San Francisco were rare. And so the forty-niners waited for weeks--or months, in overcrowded, disease-infested coastal towns. For Americans who lived in the central states, there was another way west--a well-worn path carved out several years earlier: the Oregon-California Trail. The overland road was much shorter than the sea route, but it wasn't faster. Most had no idea how severe the overland journey would be. All they could think about was gold as they plodded westward alongside covered wagons at two miles per hour--for up to six months. The first weeks on the trail took the adventurers along the Platte River, past landmarks like Chimney Rock, Courthouse Rock, and Scotts Bluffs. Military outposts like Ft. Laramie were most important as post offices--places to send letters to eager families back home--heartfelt letters of optimism and hope. We chose these questions because they would be questions that students would be most likely to ask. They are broad questions that can easily be narrowed to descriptive topics. By using the broad topics, students will gain a holistic understanding of the topic. We included research from our collection as well as from the Internet so that students would have to use the Internet as a tool for research. It not only introduces the ideas of the Gold Rush and the movement westward, but also promotes use of technology to access the information. 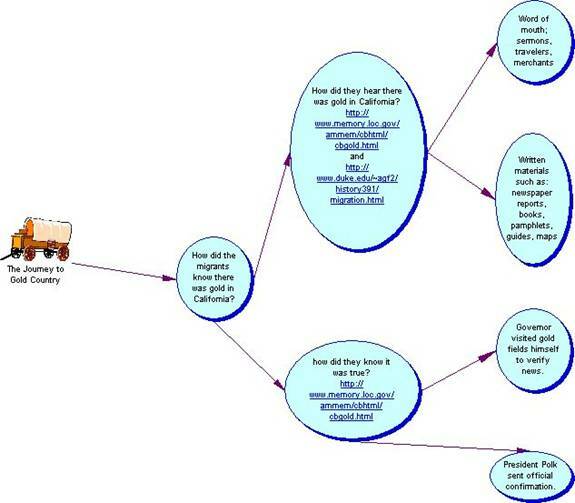 Students should probably keep a concept map, like those shown in the Analysis section, and possibly a journal from the perspective of a person living in the Gold Rush era (Woman, child, father, etc.). The information in the journal must be factual and relevant to the topic. Each day, the same question will be posed to the students for the journal, but all responses will be based on the role they have chosen to explain. Students could then be grouped up and asked to present their journals to the class, creating the appropriate setting with costumes and realia, etc. Students will be evaluated on their map, journal and presentation. Their grade will be based upon their accuracy of the information they analyzed, their teamwork, concept map, journal, and effort. After the journals are complete and the unit is coming to a close, the students could create presentations to sum up everything that they learned. The presentations are based upon the journals and students can be creative when forming their groups and their presentations. How much of the population that actually took the journey west, survived? How were lives affected after the Gold Rush excitement ended? What did they do with their gold? Invest in a business? Save? Spend it all?